Born in Oakland, California, Y&T is one of the San Francisco Bay Area’s own innovators of the hard rock sound. Whether performing to a festival crowd of fifty-thousand or in an intimate nightclub, Y&T’s highenergy set and passionate performances still captivate legions of fans around the globe, proving Y&T’s music timeless. Originally formed as Yesterday and Today, the initial powerhouse quartet—featuring Dave Meniketti (lead guitar/lead vocals), Phil Kennemore (bass), Leonard Haze (drums), and Joey Alves (rhythm guitar)— tore through the ’70s and ’80s with their own brand of hard rock. After two ’70s albums on London Records, they shortened their name to Y&T and released eight albums on A&M in the ’80s. Two more albums with Geffen Records marked an era of change with Jimmy DeGrasso (Alice Cooper, Suicidal Tendencies, Megadeth) on drums and Stef Burns (Alice Cooper, Berlin, Huey Lewis) on guitar. With a discography of 18 albums, four greatest hits collections, plus a box set, Y&T have sold over four million albums since their 1974 inception. The band’s most recent single “I’m Coming Home” has climbed to roughly 1.5 million views on YouTube. Y&T received extensive airplay with hits such as Forever, Rescue Me, Mean Streak, Don’t Stop Runnin’, and Summertime Girls—which played in heavy rotation on MTV. Y&T songs have been featured in a multitude of movies and television shows, including Real Genius, Out of Bounds, Baywatch, and Hunter. After five top 100 albums, songs that tipped into the 40s, two Bammie Awards, and many international television appearances, Y&T’s hits are still played on VH1 Classic and Classic Rock radio stations worldwide. With Kennemore’s untimely passing from lung cancer, the band carries on the legacy that is Y&T. 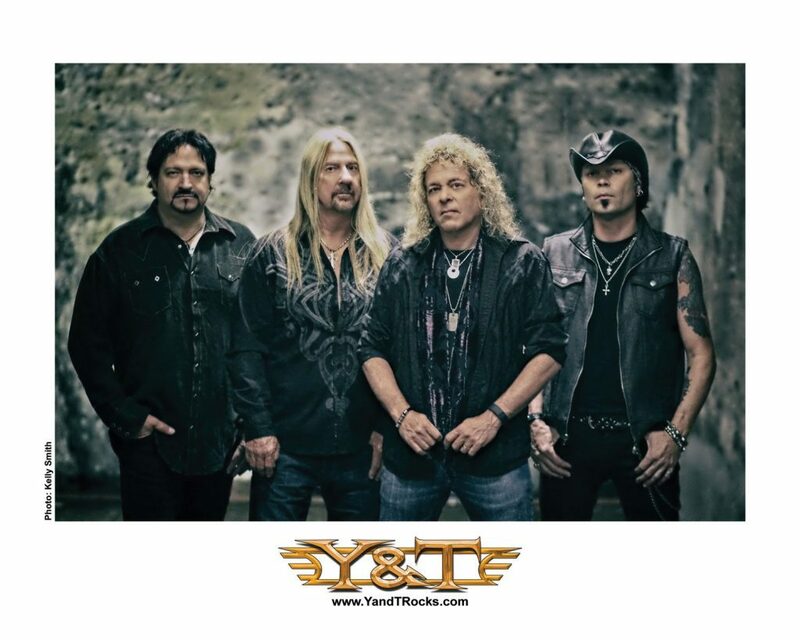 Y&T continues to tour the world, featuring the dynamic original frontman Dave Meniketti (guitar/lead vocals), John Nymann (guitar/vocals), Aaron Leigh (bass/vocals), and Mike Vanderhule (drums/vocals), playing songs that span the band’s five-decade career and including all the hits and fan favorites. Prepare to have your face melted.